"We believe this clump of dust represents the earliest stage in the formation of protoplanets, and this is the first time we've seen that stage," said Thomas Henning, of the Max Planck Institute for Astronomy (MPIA). "This is an important discovery, because we have not yet been able to observe most stages in the process of planet formation," said Carlos Carrasco-Gonzalez from the Institute of Radio Astronomy and Astrophysics (IRyA) of the National Autonomous University of Mexico (UNAM). "This is quite different from the case of star formation, where, in different objects, we have seen stars in different stages of their life cycle. 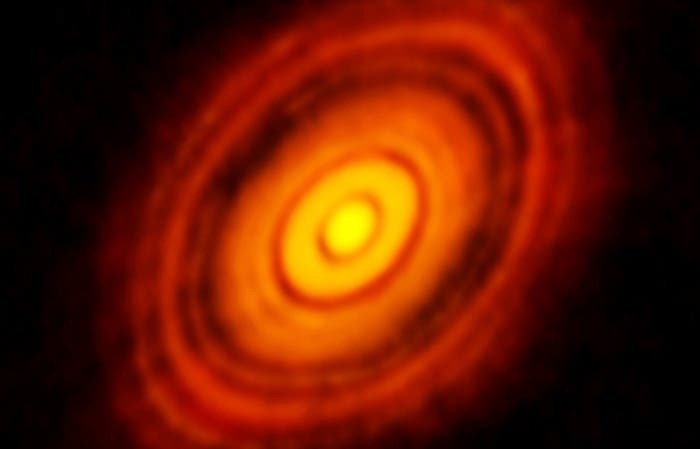 With planets, we haven't been so fortunate, so getting a look at this very early stage in planet formation is extremely valuable," he added. "These VLA observations are the most sensitive and show the most detail of any yet made of HL Tau's disk at these longer wavelengths," said Claire Chandler, of the National Radio Astronomy Observatory (NRAO). "The VLA's ability to produce such high-quality images in this region is very important to advancing our understanding of these initial stages of planet formation," Chandler added. Strange Spiral Galaxy Observed –"A First of Its Kind"